The inflatable advertisement tent take a very fast time to set up and disassemble, and the inflatable tents take the fastest time to form. For example, customers use mobile restaurant tents. Restaurant is open, you often need to be ready to work is a lot of, can't spent too much effort and time on tents, the so-called time means life, time is money, about logic, that is the reason why there is business was very tired after the staff if they spend too much energy to dismantle the tents, will no doubt make employees thoroughly exhausted, in the long term, employees will probably change jobs. 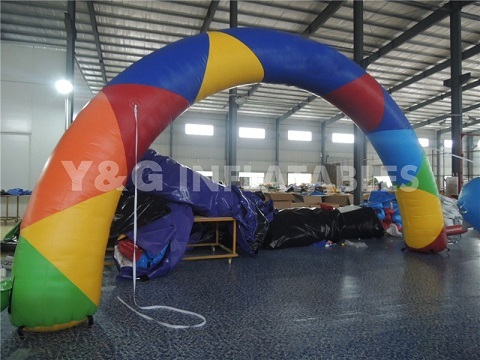 Therefore, it is better to choose the brand inflatable tents for simple assembly and disassembly. Saving time and effort is one of the biggest advantages of the inflatable tents. first of all，the waterproof effect of the inflatable tent is also the best of all. Because the outer cover of the inflatable tent is a whole, the fabric itself has a waterproof coating, and the sewing joint of the fabric is 100% heat-sealed with waterproof tape. Secondly,not only can the inflatable tent be used individually, but it can also be spliced, which not only expands the space for the number of people, but also does not make people feel crowded. what 's more: The flame retardant effect of the inflatable tents is certainly one of the highlights of all the tents. Why are the inflatable tents more expensive than other tents? The main reason is that all the materials used in the inflatable advertisement tent are flame retardant and anti-aging.